Alexa, my 21 year old daughter is now a healthy and happy young woman. However, when she was 13 years old, she contracted Lyme disease and became quite sick. Truthfully, she suffered more from her “Lyme disease treatment” than she did her Lyme disease infection. At that time, I was not treating tick borne infections, my practice was focused on using Integrative Medicine to treat Brain and Neurological disorders. Therefore, my wife Kimberly and I sought the expertise of a prominent Florida Lyme disease doctor. He was extremely knowledgeable regarding Lyme disease. Problematic, his excessive antibiotic treatment almost destroyed Alexa. I remain thankful that Alexa’s passionate LLMD diagnosed her with Borreliosis, and multiple co-infections; Babesiosis, Bartonellosis and Ehrlichiosis. 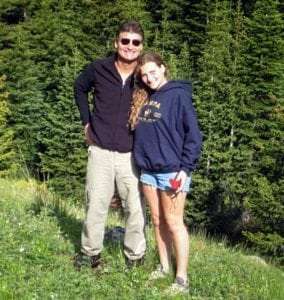 He was hyper focused on using “drugs for bugs.” With no expertise in Integrative Medicine, Alexa’s doctor could not effectively enhance her immune function, therefore his treatment relied solely on antibiotic therapy. His ability to treat antibiotic-induced depression and anxiety was poor, in fact, he wrongly assumed the Lyme disease infection was the primary cause of Alexa’s new onset psychological symptoms. His solution for detoxification of bio-toxins was Cholestyramine, a nasty medication that is rather ineffective, as compared to Intravenous Detoxification. Furthermore, while Cholestyramine does bind and remove lipophilic bio-toxins from the intestine, it also removes good fatty [lipophilic] molecules, for example; EPAs, DHAs, Vitamin A, Vitamin D and Vitamin E etc. With disregard for the ultimate destruction excessive antibiotic therapy treatment was causing Alexa, her LLMD continuously “pulsed” and “juggled” four to six different antibiotics a day. After the first six months of excessive antibiotic therapy with ineffective detoxification protocols, Alexa became much more “toxic” and much more “sickly.” She developed a myriad of antibiotic-induced disorders; Heart Burn, Esophageal Reflux, Leaky Gut Syndrome, Depression, Anxiety, Chronic Fatigue, Fibromyalgia and multiple hormonal deficiencies. Alexa’s personality changed dramatically, our once cheerful Alexa developed an obsessive “worry” type of anxiety followed by intermittent panic attacks. Alexa developed social anxiety, yet before treatment she was a social butterfly. She fell into a depression she described as a “black hole.” Her chronic fatigue worsened every month and she could no longer participate in family sports, this was particularly unsettling because Alexa was arguably the best athlete in our family. After one year of antibiotic therapy treatment, Alexa developed significant antibiotic-induced Gut Toxicity. Alexa became so toxic she was essentially bedridden! She rarely navigated from her bedroom to our kitchen. I stood back and watched, feeling rather hopeless as her father, especially since I was a physician. My wife knew that I could better treat many of Alexa’s antibiotic-induced psychological symptoms than her LLMD. Kim asked me to participate in Alexa’s care, sadly because I was not an LLMD, I refused to intervene in Alexa’s treatment. By 2008, I had already determined many foundational principles of the “Gut–Brain Connection.” My Brain Chemistry research had revealed that antibiotic-induced deficiencies of Serotonin and Taurine were causing a surge of depression and anxiety in Americans. Having correlated these neurotransmitter deficiencies with SPECT Brain imaging in my patients, I knew Alexa’s depression and anxiety was derived from excessive electrical activity in two specific brain regions, her Deep Limbic System and her Anterior Cingulate Gyrus. To learn more about my Brain Chemistry research and the Gut-Brain Connection, read the chapters I wrote for two of Brenda Watson’s bestselling books. In these chapters, I explain the underlying Biochemical mechanisms by which Gastrointestinal Dysbiosis can cause severe Depression, Anxiety and even Panic Disorder. If you like learning like most of my extremely well read patients, I suggest you purchase both of these books. They are extremely informative and contain interviews with several brilliant physicians. You should also watch this PBS interview I gave with intestinal expert Brenda Watson*. In the interview, I explain how antibiotics in our food and water supply are causing a drastic rise in psychological and neurological disorders. I also explain some of the Biochemical Mechanisms of the Gut-Brain Connection. Why I decided to intervene after two years of failed treatments. If you have now read the chapters I wrote on the Gut-Brain Connection, you are wondering why I abstained from treating my daughter. Because, when I attempted to discuss Brain Chemistry with Alexa’s LLMD, he insisted all of her depression and anxiety was derived from her Lyme disease infection, not from the antibiotics he was prescribing. Deep in my heart, I knew better, but out of fear of being wrong, I foolishly chose to remain Alexa’s father and not her doctor, something I deeply regret and will never do again. My wife Kimberly and I painfully watched throughout the second year of Alexa’s lyme disease treatment consisting of multiple antibiotic regimens, while she became even more fatigued and for lack of a better word, “more sickly.” Kim and I know, from personal experience, what you parents go through when your child suffers with Chronic Lyme Disease, and the overwhelming fear that grips your chest when you watch the “Lyme disease treatment” make them worse. With The Help Of My Wife, I Began Treating Alexa. Thank God for mothers. Mothers like my wife Kimberly, they always rise to the occasion; they read, they research, and they are relentless until they find quality treatment for their sick children! My wife began performing intensive homeopathic and naturopathic research. Every night I came home to a stack of papers, research my wife had gathered that day, some of it, quite frankly, I initially questioned. Thankfully, because of my wife, I had already transitioned into Integrative Medicine. However, having initially trained in Critical Care Medicine, I remained somewhat skeptical. However, the more naturopathic literature I read, the more it made sense! Why are we focusing solely on “drugs for bugs” and not on optimizing immune function? As it turned out, learning how to optimize Alexa’s “kill power” required extensive research and voluminous reading. The best studies, of course, were not from America, rather they were derived from European countries, especially from Germany. Ultimately, it became clear that toxin overload was the primary causation of Alexa’s inability to get better and, subsequently her inability to kill infections. After reading thousands of studies on PUB MED, many from Germany, I surmised that Mold Toxicity was the primary cause of Alexa’s immunosuppression, not the Lyme disease itself. Alexa, like most of the Chronic Lyme disease patients I have since treated, was suffering immune suppression from severe Trichothecene toxicity. Trichothecenes are toxic gases produced by Stachybotrus mold and other indoor molds known as Black molds. To learn more about Mold Toxicity and how Mold Mycotoxins shut down our immune function, go to our Mold Toxicity page. My clinical research in thousands of Lyme patients has proven that one rarely sees a “chronic” Lyme patient, a patient who cannot effectively kill their Lyme disease infection, or their co-infections, unless they have the mold toxin genetics, genetics that render them unable to effectively detoxify mold mycotoxins. Combining my wife’s research, my research, my experience treating Brain disorders, and the experience I gained through years of treating hospitalized Critical Care patients, we designed an Integrative Treatment for Lyme Disease. This mostly natural Lyme disease treatment is extremely comprehensive and ever evolving. It was derived through prayer, God’s guidance and hard work. The initial version saved Alexa’s life. Today Alexa is a healthy young woman with a bright future*. From our personal experience, we have chosen our mission statement.